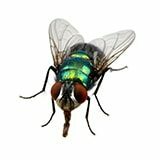 These flies are bright green and have a metallic sheen. These flies are usually the first insects to arrive and infest an animal after it dies. The larvae of green bottle flies are often used by forensic entomologists to help determine the time of death in murder cases. Generally, these flies are most active on warm, sunny days and rest on cool and/or cloudy days. Indoors they are attracted to the bright light from windows, as well as certain light bulbs. Dead rodents, birds and other small animals can be the source of flies within structures, while dog excrement, garbage and compost piles are common outdoor sources. Because they are attracted to animal excrement and freshly dead materials, these flies may transfer pathogenic bacteria from one material to another. For example, Salmonella is easily carried on the feet of green bottle flies from dog droppings outdoors to meat or other foods. Adults measure 1/4-3/8 of an inch (6-9.5 millimeters) long; thorax and abdomen shiny, usually metallic green, thorax without stripes. Filth such as human excrement and sewage, fresh animal droppings and carcasses, decaying vegetation, and garbage. Females lay about 180 eggs at one time; more than 2,000 in a lifetime. Depending on temperatures, eggs can hatch within eight to 42 hours, but will not hatch if temperatures are above 99°F/37°C. Developmental time (egg to adult) may require 10 days or more. Excluding filthy green bottle flies from a facility is a challenge in the summer, especially when they can fly from breeding materials miles away.